European Union competition regulators have today handed down a €1.49 billion fine to Alphabet's Google for blocking rival online search advertisers. This marks the company's third penalty in two years. This followed a €2.42 billion fine in 2017 for hindering rivals of shopping comparison websites. The European Commission said today's fine accounted for 1.29% of Google's turnover in 2018. The latest case concerned websites, such as of newspaper or travel sites, with a search function that produces search results and search adverts. Google's AdSense for Search provided such search adverts. The misconduct included stopping publishers from placing any search adverts from competitors on their search results pages. This forced them to reserve the most profitable space on their search results pages for Google's adverts and also required them to seek written approval from Google before making changes to the way in which any rival adverts were displayed. 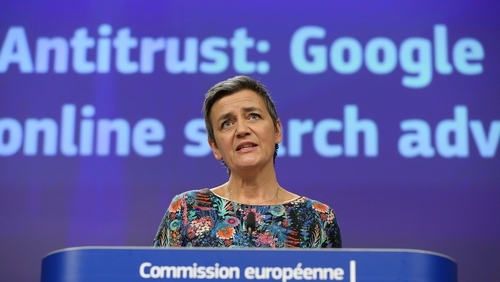 "Today the Commission has fined Google €1.49 billion for illegal misuse of its dominant position in the market for the brokering of online search adverts," EU Competition Commissioner Margrethe Vestager said. The Commissioner said that Google has "cemented its dominance in online search adverts and shielded itself from competitive pressure by imposing anti-competitive contractual restrictions on third-party websites". "The misconduct lasted over 10 years and denied other companies the possibility to compete on the merits and to innovate - and consumers the benefits of competition," she added. But Commissioner Vestager today gave a cautious welcome to Google's attempts to boost rivals and offer Android users a choice of browser and search apps in order to comply with her orders in two separate cases. "We see positive developments both in the shopping and Android case," Vestager told a news conference. In a sign that Google's regulatory troubles may not beover, Vestager said she was still looking into its actions in search market for jobs and local search following complaints. Kent Walker, SVP of Global Affairs at Google, said the company has always agreed that healthy, thriving markets are in everyone's interest. "We've already made a wide range of changes to our products to address the Commission's concerns. Over the next few months, we'll be making further updates to give more visibility to rivals in Europe," Mr Walker said.